Jeff Krajacic was shocked to learn that a rare form of bone cancer was to blame for changes in his voice. He was even more stunned when he found out that the malignancy, and the problems it caused, could be treated using a piece of his ear. Jeff Krajacic is a talker. During conversation, words bubble out of him so rapidly he's barely spoken them before he's onto the next sentence. His voice is an extension of himself. But that important part of Jeff's personality was nearly taken away when he developed a rare form of bone cancer in his voice box. The cancer, called chondrosarcoma, formed in the rings of Jeff's trachea. Before it was discovered in the summer of 2016, a tumor paralyzed one of his vocal cords. It grew so large that most of his airway was obstructed. Jeff, who lives on a lake near Milwaukee, sought medical advice from several specialists before coming to Minnesota. At Mayo Clinic's Rochester campus, he met Eric Moore, M.D., in the Department of Otorhinolaryngology. Working with Dr. Moore and the rest of his care team, Jeff ultimately received a pioneering therapy that removed the mass, along with the structures it had invaded, while preserving his voice. "It was a big leap of faith on his part." — Eric Moore, M.D. The procedure had only been performed in three other patients at Mayo Clinic. And it wasn't without risk. "It takes a very unique person who is enthusiastic and can process the challenges and the risks that might be involved but also be willing to go for it, not only to help themselves but hopefully help other people," Dr. Moore says. "It was a big leap of faith on his part." Jeff says he had no doubt that it would work. "I have nothing but the utmost respect for Dr. Moore," Jeff says. "As a surgeon, he exuded confidence. His bedside manner is unbelievable. He's a world-class human." In the past, chondrosarcomas, which are slow-growing tumors, were picked apart and removed little by little, Dr. Moore says. Cases like Jeff's, in which the tumor invades the foundation of the voice box, used to result in the removal of portions of the cricoid cartilage — a ringlike structure in the trachea that's essential for breathing. In many cases, patients required a permanent tracheostomy to help them breathe after receiving the procedure. If the tumor enveloped the vocal chords, a laryngectomy — the removal of the voice box — also could be necessary. "Obviously, that was devastating. It was unacceptable," Jeff says. "I'm a very active marathon runner, otherwise a very healthy individual. None of those things were viable outcomes." The evolution of Jeff's treatment was a marriage of two ideas. At Mayo Clinic, physicians have for years been able to successfully remove portions of patients' voice boxes while keeping the integrity of the surrounding structures intact. Mayo physicians also have used implantable cartilage grafts from the ear to correct deformities in other areas of the body. "Like a lot of things, it builds off of one idea that builds off another that leads to another," Dr. Moore says. Jeff's treatment consisted of a two-step procedure. The first involved surgically removing a piece of cartilage from Jeff's outer ear and implanting it into his forearm to grow. After the cartilage had developed its own system of blood vessels, Jeff underwent a second surgery. During that operation, Dr. Moore removed the cartilage from Jeff's arm, took the tumor out of his throat, and then grafted the cartilage into the area that was reduced as a result of the surgery. When the procedure was first explained to Jeff, he was taken aback. He'd been informed by specialists elsewhere that the tumor could be partially removed, which would open his airway and restore his function. Learning that the entire tumor could be removed using Dr. Moore’s approach appealed to him. "I didn't want to ruin the chance of having that thing gone," Jeff says. "I wanted to be able to teach my grandkids how to waterski. I wanted to be able to run and play with them." Jeff underwent the first part of the procedure in September 2016. Dr. Moore removed the cartilage from Jeff's ear and implanted it into his forearm. Because cartilage lacks blood vessels, the implantation was necessary to stimulate the tissue to develop a living lining of blood vessels. After that, Jeff went home to Wisconsin to recover. A week later, he began to have extreme difficulty breathing. When Jeff was originally diagnosed, his care team found that the tumor had diminished his breathing capacity to just 10 percent. Now it was completely obstructing his airway. 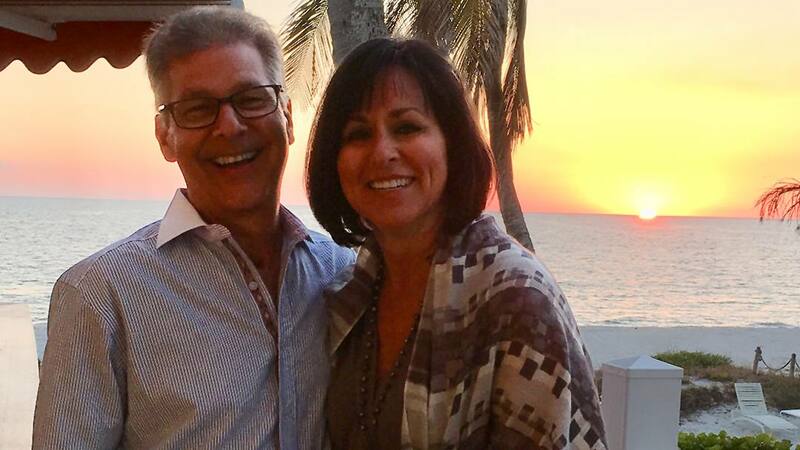 Jeff's wife, Deb, rushed him to a nearby emergency department. On the way, Jeff lost consciousness. At the hospital, Deb explained Jeff's medical situation to the staff. He needed a tracheostomy to allow him to breathe. But the team had to place it in a way that took the tumor into account. "Through the grace of the good Lord and the ER doctor, I got a trach in," Jeff says. "We learned after the fact that we were down to minutes. I wasn't breathing." Jeff spent the next two days in intensive care and three additional nights in the hospital. A week after being discharged, Jeff returned to Mayo Clinic. Dr. Moore evaluated the placement of the tracheostomy to determine if Jeff could undergo the second stage of his treatment. "It was low enough and in a proper position, so we were able to proceed," Jeff says. Two weeks later, Jeff underwent the second surgery. The tumor, which was about the size of a golf ball, was removed, and Jeff's trachea was rebuilt. "When I came out of surgery there was a castlike article on my left arm, I was connected to wires and monitors, and my throat was swollen bigger than my head," Jeff says. Throughout the weeks and months that followed, the swelling went down, and his voice began to return. Jeff grew accustomed to his tracheostomy and the necessity of covering it to speak. "Going through this process, part of me thought I would never get off the trach," Jeff says. "You're not allowed to swim. Talking was hard. But healing is a wonderful thing." Jeff's reconstructed voice box required several surgical tweaks, including the placement and later removal of a stent that helped widen his throat. Six weeks after his last surgery, Jeff began capping his tracheostomy and learning how to breathe again. On Feb. 17, 2017, he and Deb returned to Mayo Clinic to have it removed. "We were in Dr. Moore's office, and he says to my wife, 'Do you want to do the honor?'" Jeff says. "All they did was pull it out and put a Band-Aid on it. We celebrated with a good bottle of wine and a phenomenal dinner." Less than three weeks later, the hole in Jeff's throat was closed, and he returned to work. After another month, he began walking on the treadmill and regaining the stamina he had lost through his medical episode. Although Jeff's voice has changed, his ability to speak hasn't diminished. "My voice is a little lower. I'm not as loud," he says. "But I can talk, and people can hear me." Jeff's ordeal has given him new appreciation for life and gratitude for his Mayo Clinic medical team's ability to advance science. He is so thankful for Dr. Moore's help he created a video message to express his gratitude. In the video, which Jeff made with the help of his family, he is slaloming on a water ski. Later in the clip, he includes a message to Dr. Moore: "Doc, God bless you and thank you. This would be impossible to do with the trach." Learn more about the Department of Otorhinolaryngology.